Carports and garages help protect your car from the elements. They prevent hail, snow, and rain from hitting your car, and when attached to your home, allow you to bypass these elements to get to and from your vehicle. Despite these few similar attributes, however, carports and garages are very different structures. We outline the differences between the two materials below so that you can make a more informed decision about which one might be right for your home. Both carports and garages are available in many different looks and styles. Carports may be a simple metal frame with a roof, a metal frame draped in fabric, or a permanent structure attached to your home. A carport may have no walls or three walls. These walls may be made of brick, stone, or sided to match your home. Attached carports may also be used as an outdoor patio area as well as a car cover because they are open on at least one side. Garages may be attached to your home or a freestanding structure. They always have four walls and a roof and are a completely enclosed room. While a carport may be a standalone structure erected for simplicity, garages are most likely to match the rest of your home in style, appearance, and material. 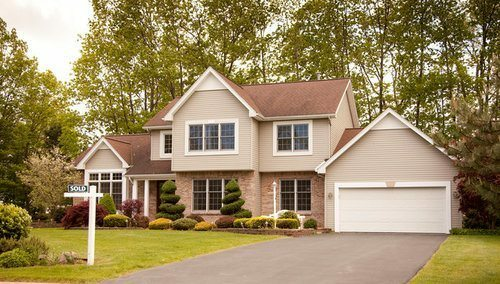 Whether the garage is attached to your home or freestanding, it is likely to have the same siding and roofing material as the rest of your property. Carports are designed to shelter a vehicle from the worst of the elements. Whether they have walls or not, they do not have a door or way to secure the shelter. They are not usually used for storage because your things could be stolen or exposed to the elements. In addition, carports are not considered living areas. For these reasons, they are easier and less expensive to build because they do not need to conform to building codes. However, it also means that you will not use them for personal shelter, sleeping, or storing your things. Garages are often used for storage in addition to holding your vehicle. They can be locked and are often attached to the house for easy access. It is common for a garage to also house tools, lawn mowers, bikes, outdoor equipment, or other items. Garages may also be finished to allow use for businesses or have a second floor added above them to create an additional living space. No matter what type of carport you erect, it is likely to be a faster, easier installation than a garage. Because carports can be a simple frame with a roof, they can be installed in a matter of hours to days. Even if they have three walls, they are unlikely to have windows and no door, so installation takes less time. Carport kits are available that let you construct a simple structure yourself. For more elaborate designs or carports that are attached to your home, it is best to have a contractor do the installation. Both carports and garages are installed on a concrete slab 1. 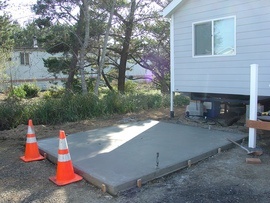 If you do not currently have a slab in the preferred area, the ground needs to be leveled, and a slab poured. From there, a carport can be easily built either out of a metal frame or a simple, three-sided structure. Garages are a more involved process for building. They will have four walls, as well as a door that can be opened and closed to allow the entry of cars. The walls will often be cinder block or another durable material and covered with siding that matches what is used on the rest of your home. This process can take days to weeks to complete, depending on the size and how you intend to finish the interior. Both carports and garages have a wide range of costs. In the case of garages, the costs are primarily related to the size and what type of finishing materials you use. Because the garage must match the house, if you have an expensive facade, the garage will increase in cost as well. For carports, costs are largely driven by whether this is an open carport or whether it has walls and what those walls are made of. A simple carport may only cost a few hundred dollars, while a permanent structure will cost more. Both carports and garages need a foundation or slab. For a 20x20-foot area, the cost of pouring this foundation will be around $1,200 if you do not already have a slab. The average cost of a very basic garage is about $30 a square foot for installation, which makes a 20x20-foot garage cost around $13,200. Keep in mind, that finishing costs and materials usually add another $20,000 to the total for an average cost of $33,200 for a fully enclosed garage with doors. In contrast, a permanent carport with a roof that attaches to the side of your home will cost about $6,000 on average in materials and labor, for a total of $7,200 with a slab. Carports are not seen as living space, so they do not need to conform to the same standards used for constructing homes. Therefore, fewer cities require that you pull a permit, and there are few to no regulations for size or material. Garages, however, are considered part of the living area. The walls must be flame-retardant and often insulated. They usually have electricity, which requires another set of codes. They will require both a permit and an inspection, which can add to building costs and timelines. Carports help keep the elements off of your car. They protect it from the hot sun, hail, rain, and snow. But because they do not have a door and in many cases do not have walls, they do not protect your vehicle from theft. If the carport is open on all sides, you may still need to deal with issues surrounding heavy snowfall if you live in a cold climate. Garages offer more security and protection for your vehicle. The garage doors may be locked when not open, so your car and belongings are safer. Because there are four walls as well as a roof, a garage will also do a better job of preventing the elements from getting inside. Adding a single car garage to a property that currently does not have one can increase the property value by about $10,000. Permanent carports do not increase values, but they can make the property more attractive to buyers if there is no other garage currently on the site.